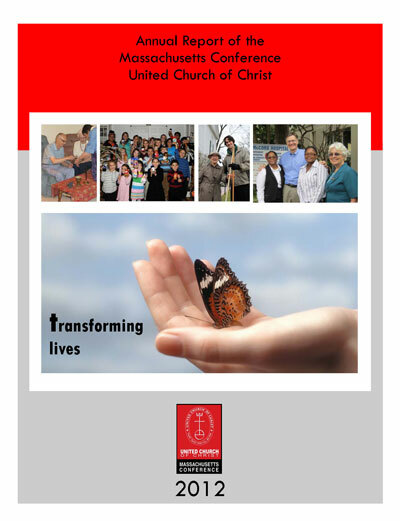 The Massachusetts Conference's 2012 Annual Report is now available. It can be downloaded here, or printed copies can be obtained by contacting Karen Methot. Download the 22-page report here. Jesus transformed lives. Many of the most joyous stories in scripture witness this truth. The eyes of a once-blind man are opened. The host of a private banquet throws open the doors to welcome strangers. A despairing father runs to embrace his long lost son. Jesus also transformed our life together. Rather than responding to aggression with violence, Jesus invites us to turn the other cheek. In place of hatred, Jesus calls us to love our enemies. Jesus’ first followers held all things in common. And after only a few years, those first followers came to be known as the ones who turned the world upside down. [Acts 17:6]. Transformation does not come easily. Too often, we cling to familiar ways, even though we long to have our lives transformed. This is where church comes in. Churches have choices. And discerning our choices has never been more important. As you will see from the inspiring stories on these pages, countless churches in the Massachusetts Conference are choosing transformation. The fact that over 10% of all ONA UCC churches in the country are in the Massachusetts Conference attests to that. The fact that over 60% of our pastors are part of a Clergy Community of Practice attests to that. And the fact that the Massachusetts Conference has over 50% of all UCC clergy under 40 years of age attests to that. These pages also testify to the role your Conference staff and volunteer leaders are playing as churches choose transformation. In the Massachusetts Conference no church needs to be alone; no pastor needs to feel isolated. Our Conference staff and leaders are building a covenantal web of relationships that grow out of Jesus’ call to discipleship – enabling congregations, lay leaders and pastors to envision and live into a faithful, bold and resilient future. These pages – and the issues we will engage at Annual Meeting – also testify to the ways our life together as a Conference is transforming. And it’s important to lift up the fact that the innovations, initiatives and experiments of the Massachusetts Conference are helping to shape the entire UCC. Our Pastoral Excellence Program will soon find its way into over a dozen UCC Conferences, and may well expand to other denominations. And our 2009 resolution on climate change, along with our Green Congregations program is a model for other Conferences and denominations. In the coming year, let us continue to join in Jesus’ ministry of transformation.